1. Define talent management and explain why it is important. 2. 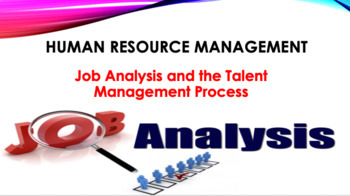 Discuss the process of job analysis, including why it is important. 3. Explain how to use at least three methods of collecting job analysis information, including interviews, questionnaires, and observation. 4. Explain how you would write a job description. 5. Explain how to write a job specification. 6. List some human traits and behaviors you would want an employee to bring to a job if employee engagement is important to doing the job well. 7. Explain competency-based job analysis, including what it means and how it’s done in practice.